The sequencer is designed to control via MIDI any external sound modules, samplers, synthesizers and other applications running on iPad or another computer. Full support for external MIDI interfaces, network and virtual ports, synchronization with external devices and transport control makes this sequencer like playback control center for music devices or other applications. Indispensable tool in creation of final composition or experiments with rhythm and phrase patterns. User interface is designed so that all features of the current mode are available immediately or through one or two steps. Can be operated with one hand, even with one finger, in any place of your workspace to which you can reach. Does not have complicated gestures, very small elements which are inconvenient for clicks, clumsy scrolling and distracting realistic interface elements. Just only single click and move fader. Classical data structure: Project - Song - Pattern. Four main control modes - Transport, Keyboard, Edit pattern, Edit cell. No need to save data. All changes will be saved automatically. Pattern tracks can be configured for notes or drum events. Real-time recording and editing patterns. Recording and editing events through internal keyboard or external devices. Playback one or more patterns at once. Start and stop patterns during playback. Changes pattern events (Transposition, Velocity, Duration) during playback. Editing individual events or changes all events in track. Length of pattern is defined by last note or can be set to fixed value. Correct simultaneous playback patterns with different length. Each pattern and song track have individual mute/solo function. Song can contain patterns from current project and patterns from any other projects. Extended set of editing functions for patterns and songs - insert, delete, move and scroll a single event or entire track. 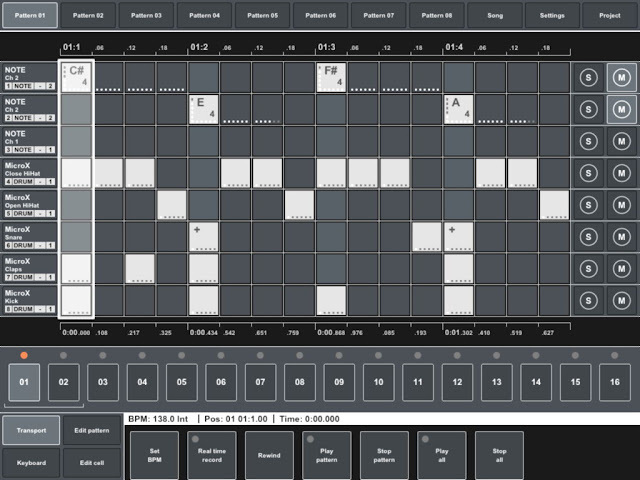 Ability to set track titles, pattern titles (pattern button titles) and drum pad titles. Set of different color schemes of interface. Full support of all external MIDI interfaces based on CoreMIDI (like iRig, MIDI Mobilizer II, StudioConnect, iConnectMIDI, IO dock, Camera Connection Kit). Each track can be configured for output to any MIDI channel (or more channels) and different devices. Creating virtual MIDI port for connect to internal iPad applications (like PPG Wave, SampleTank, GarageBand and others). Synchronization with external device that send MIDI clock. Send own MIDI clock to external devices and applications as master device. Send transport commands Start/Stop/Continue to external devices. Controlled by external transport commands Start/Stop/Continue. Internal metronome on standard audio output. Metronome can start at recording only or at playback and recording. Metronome can start immediately or within one or two measures before. MIDI console displays all input MIDI messages in convenient form. Activity indicator shows channels of incoming MIDI messages. Displays external BPM value and status of synchronization.